A new clip from the Dundee Super Bowl commercial has been released online and it features another throwback to the original Crocodile Dundee movie. Just last week Dundee popped up out of nowhere with a teaser clip, a website, and a new interview from People Magazine with Paul Hogan and Danny McBride talking about bringing Crocodile Dundee to a new generation. It wasn't clear what exactly we were looking at, but the website promised a movie by this summer. However, it has now been proven that Dundee will be a Super Bowl 2018 commercial for Tourism Australia. The new clip features Danny McBride as Crocodile Dundee's son Brian, trying to use the "old bushman's trick" from the original movie while Chris Hemsworth's Wally Jr. watches. Only Brian is really far away from the water buffalo while trying to use the "mind over matter" trick and eventually gives up. The short 1-minute clip is exactly what we've come to expect from the crazy expensive Super Bowl ad. Most fans are sitting around waiting for Paul Hogan to make his first appearance. It's rumored that the total budget for Dundee was $30 million, according to the IMDB page with a 30-second Super Bowl spot costing about $4.5 million. This has led to speculation that we'll see some kind of short Dundee film spread out across the big game day in an effort to promote Tourism Australia. The team behind the commercial are being tight -lipped about the project and still aren't admitting that it's really just an elaborate commercial, which is still adding a little mystique, but other Super Bowl 2018 commercials are starting to pop up online early. 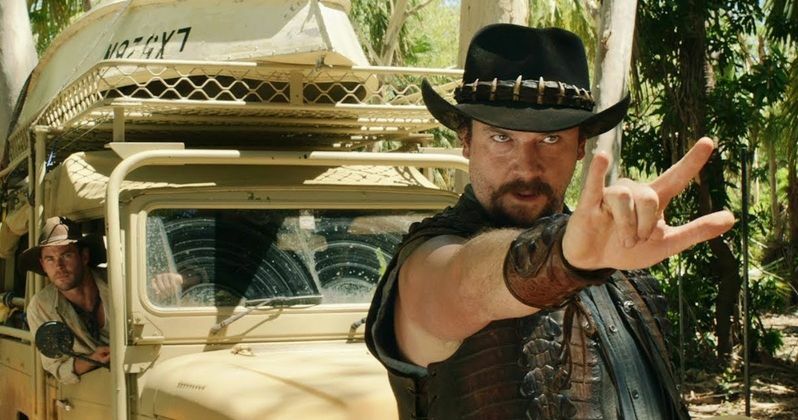 The Dundee project has all of the makings for a real feature-length movie with a pretty believable synopsis that has Danny McBride as Crocodile Dundee's son from America who has been sent to the Australian Outback to rescue his father. McBride is playing the similar know-it-all character that we've seen him play over the years while Chris Hemsworth plays the real expert Australian outdoorsman. Though the idea of another Crocodile Dundee sequel brought up complaints and a little bit of controversy, a lot of those same people were bummed to find out that it's just a Super Bowl commercial. The latest clip from Dundee is easily the best one so far, with a healthy dose of throwback to the original franchise, so it will be interesting to see what they pulled off when the Super Bowl airs on February 4th. Will it be just one longish commercial, or will it turn out to be an actual short film spread out across the duration of the big game? We'll just have to wait until next month to see for sure. In the meantime, you can check out the brand-new clip below, courtesy of Dundee Movie's YouTube channel.